I’ve noticed before with kiddies when they want a cake that’s green, they won’t actually eat it because it’s green. 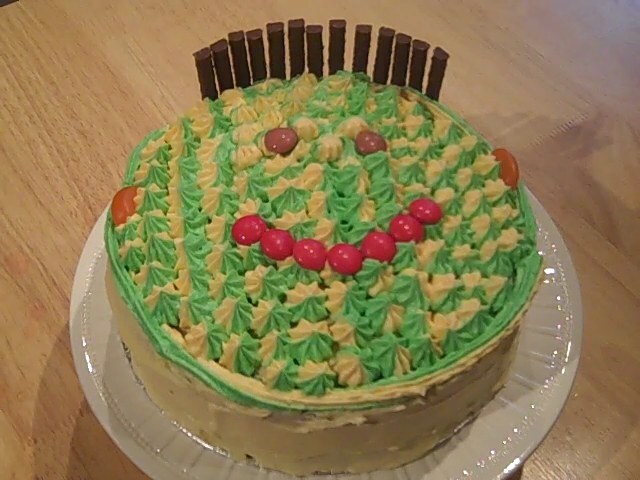 Which is why I opted for the mixture of green and cream with this cake. Line two 8 inch sponge tins with baking parchment. Cream the butter and sugar together until the mixture is pale, light and fluffy. Sift the flour and salt and carefully add to the mixture, folding it in with a metal spoon or spatula. Divide the mixture between the tins and smooth over with a spatula. Place then on the same shelf in the centre of the oven and bake for 25-30 minutes until well risen, golden brown and beginning to shrink from the sides of the tins. Remove from the oven and allow to stand for 5 minutes. Loosen the cakes from around the edge of the tins using a spatula. Turn onto a wire rack to cool completely. When completely cool, sandwich together with strawberry jam. In a large bowl beat the butter, vanilla extract and half the icing sugar until smooth – this can take several minutes with an electric hand mixer. Gradually add the remainder of the icing sugar and beat again until the buttercream is smooth and creamy. If you want to colour your buttercream, always start with one drop of colour at a time and beat after each addition. 1 – 2 drops are usually enough for a pastel colour. I then crumb coated the cake and put it in the fridge for 20 minutes. Then using a star nozzle covered the top of the cake, before adding eyes, smiling mouth and ears, with Smarties and jelly beans. I then used crunchy mint sticks to stick to the buttercream for the hair.